Have you looked up recently? 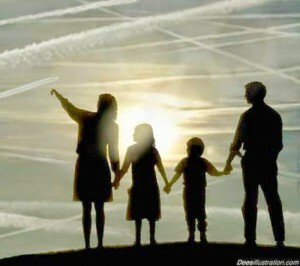 They still spray: aluminum, barium (say that one aloud) and strontium. According to Lisa Martino-Taylor, a sociologist, the United States military carried out top secret experiments involving the spraying of radioactive particles on residents of St. Louis, Missouri for years. This is hardly surprising given the fact that the entire United States is currently engaged in a massive human experiment when we already know that the results will be nothing short of horrific. Let’s also not forget that we continue to support the use of dangerous substances and technologies, even though we know that disaster is a certainty. It is public knowledge that the government sprayed zinc cadmium sulfide particles – which are supposedly harmless – over St. Louis, but Professor Martino-Taylor says that her research indicates a radioactive additive was also mixed in with the compound. The targets of these experiments were primarily minorities and low-income communities – again, hardly surprising given the U.S. government’s history of conducting brutal tests on disadvantaged populations – who had no clue that they were being subjected to dangerous chemicals from 1953-1954 and 1963-1965. Martino-Taylor’s research uncovered photographs showing just how these particles were distributed as well as detailed descriptions of how the public was exposed to these substances in the name of keeping America safe. In Corpus Christi, Texas the chemical was dispersed over large portions of the city from airplanes while in St. Louis, the U.S. Army placed chemical sprayers on schools and public housing projects, among other buildings, as well as on station wagons for mobile spraying. Even local politicians were kept totally out of the loop with St. Louis residents simply being told that the Army was testing smoke screen technology to protect American cities from a potential Russian attack. Read more at Researcher says Army scientists secretly sprayed cities with radioactive particles for years – End the Lie – Independent News | End the Lie – Independent News. Was Boston bombing a terror attack or a false flag?!! !